The Arts-and-Crafts era in America lasted from around the turn of the 20th century until the mid 1920's. It was expressed in different styles, influenced by architects like Frank Lloyd Wright, Charles and Henry Greene, George Washington Maher, Julia Morgan, and Bernard Maybeck. 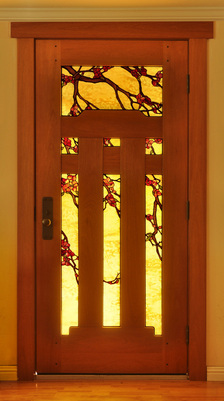 The elements to create a unique Arts-and-Crafts door are found in many places. 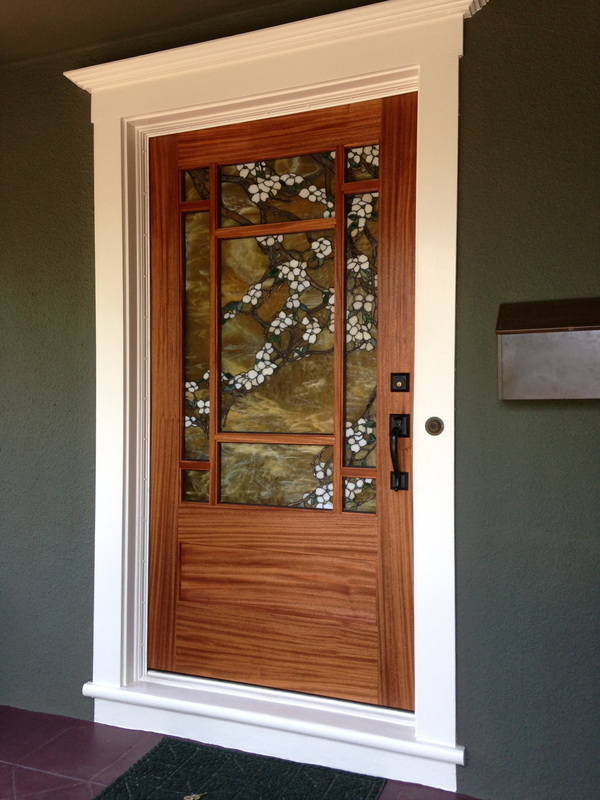 Here are a few of the styles that influence my designs, and details from each can be combined to create a truly custom entryway, interior door, window, or other architectural element for your home. The craftsman door has become very popular in recent years, as the elegantly simple design fits so well with almost any home. Though its origin is not clear, it most likely came about in California at the end of the 19th century with the developing California Bungalow style. 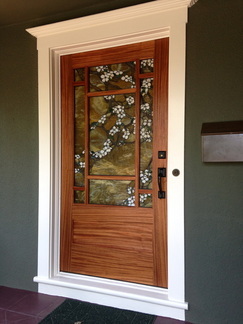 Traditional elements of a craftsman door are the small rectangular glass panes along the top, a dentil shelf, and flat wood panels below. The dentil shelf offers a unique opportunity for variation, by altering the size, shape and number of dentils below and shape and size of the shelf above. Dentils can be curved, scalloped, or angled and can range in number from two to eight or more. Though Frank Lloyd Wright's career spanned many architectural styles, his work in the Arts-and-Crafts era came to define a style that endures today. The Prairie style was developed in the mid-west, but it can be seen from the hills of Berkeley, California to Buffalo, New York. Prairie style architecture has at its core the concept of embracing the landscape and connecting the indoors with the outdoors. This is done primarily through the use of natural light, making glass the most important element in a Prairie style door. The traditional design is a 9-light pattern, with a large center glass panel surrounded by rectangles and small squares in the corners. This can be varied by moving the dividing bars or adding a wood panel below. Architects Charles and Henry Greene developed a style all their own. Though they did not consider their work a part of the Arts-and-Crafts movement, their influence on other architects and on the California Bungalow style cannot be denied. Their most famous works, the Ultimate Bungalows like the Gamble House, Blacker House, and Thorsen House, are masterworks in every respect. They designed every detail, from the bricks in the walkways to the light fixtures and even the furniture, to work in harmony with each other and with the land on which the homes sit. Japanese art was a major inspiration for Greene and Greene, and its influence can be seen in the soft curves of the "cloud lift" element they employed on furniture, structural elements, windows, and doors. All corners are rounded over to soften the appearance and lend a more organic look. Another often used detail is the ebony tenon plug, a small piece of ebony inlaid into the wood at each joint. 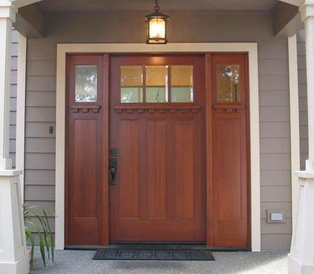 This is an element that fits well with other door styles as well.